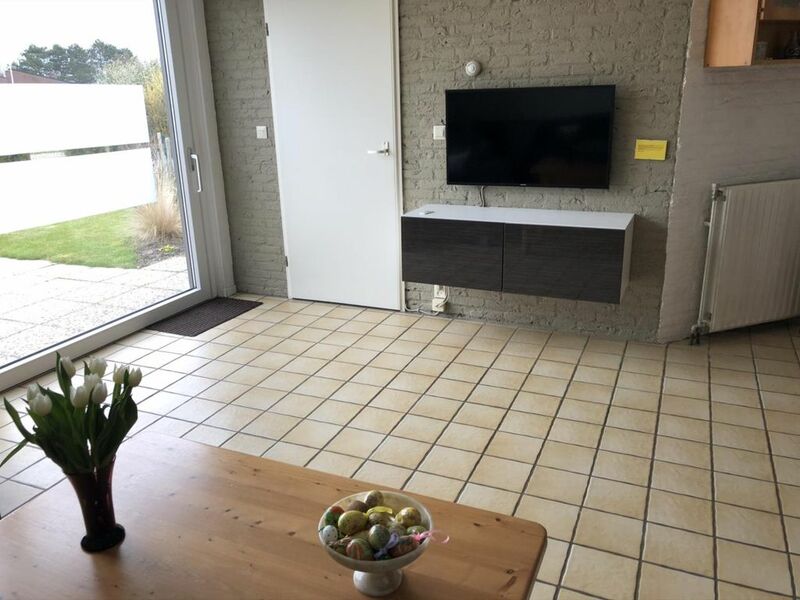 At the foot of a beautiful dune area in the quaint bathing resort of Nieuwvliet-Bad (Zeeuws Flanders), 2 km from Cadzand, lies the quiet St. Pierre bungalow park with its spacious layout. Its location, close to the North Sea beaches, guarantees plenty of seaside fun. This cozy, comfortably furnished bungalow is situated right behind the dunes. The sea and beach are only 100 meters away. You cannot get any closer! Very quiet and private. Excellently suited for families with little children or older persons. Nieuwvliet has the most beautiful and widest beaches on the Zeeuws Flanders' coast. The surrounding area is ideal for nature lovers, hikers, cyclists and horseback riders. 10 km away there is an excellent golf course. The "Het Zwin" nature reserve is certainly worth your while, as well as a visit to the historic towns of Sluis and Aardenburg. A trip to the Belgian towns of Brugge, Knokke and Gent are also recommended. a living/dining room with a color TV and stereo with CD-player; an open kitchen; dish washer, a scullery with washing machine and microwave; a bathroom with a sink and shower; and a separate toilet. On the first floor there is one bedroom furnished with a double bed and one bedroom furnished with two single beds. Baby bed, highchair and playpen are present. The enclosed garden offers lots of privacy and contains a covered bicycle shelter. Private parking is by the door. In the storage there is room for 2 electric bikes. The layout of the accommodations may vary. - Pets are not allowed upstairs or on the chairs. - If something breaks, please report it instead of replacing it yourself. - Please leave the house clean and clear - treat the furniture as if it were your own!!! - Upon departure unplug the refrigerator and leave the door open; Set the thermostat at its lowest setting. Pet + extra cleaning costs: 40 euros per week. Pets are not allowed on the couch. A unique mix of Flanders and Zealand, that's Zeeuws Flanders: easy-going, lovers of the good life; coasts and towns; time and hospitality. The landscape contains old creeks, dikes with pollard-willows, estuaries and mud-flats. You will feel at home in cozy towns like Sluis and Hulst, where shops are open every day. Visit the southern neighbors! Beautiful Bruges lies just a stone's throw away. You can stroll endlessly along the Zeeuws Flanders coast where with a little luck you can find sharks' teeth. Savor the local specialties while pondering an unforgettable island trip around Zealand province. Less than 1 km away lie tennis courts, an indoor swimming pool, possibilities for delta-flying, a fitness center and bowling alleys. There is a golf course 10 km away.